After 26 years as a full-time employee of the London Police Department, Chief David Wiseman is resigning. Wiseman accepted a job with the Delaware County Sheriff’s Office, where he is working part-time. He will continue to serve as London police chief until his replacement is named, after which he will go full-time with Delaware. He has served as police chief for the past six years. Wiseman will serve as commander of the Delaware County Sheriff’s Office, a new position for the agency. As such, he will oversee the Delaware Area Career Center’s Police Academy and oversee training at the sheriff’s office. He is part of Sheriff Ross Martin’s command staff. Wiseman brings to his new job a great deal of experience in law enforcement education and training. 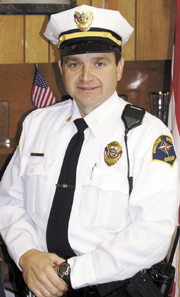 For over 20 years, he has served as a certified instructor and commander for Ohio’s basic police academies. He also is an adjutant instructor in the criminal justice degree programs at Clark State and Columbus State com-munity colleges. In 2013, Gov. John Kasich appointed Wiseman to the Ohio Peace Officer Training Commission. Over the course of his career, Wiseman has seen many changes, from how policemen are equipped to the types of crime that prevail in London. He remembers when radio systems were marginal, ballistic vests were almost non-existent, and computers weren’t part of the routine. As for crime, he said computer-based crimes, Internet scams and credit card theft top the list these days. Wiseman said he and his family will continue to reside in London. The London Civil Service Commission will handle the process of replacing Wiseman. The job will be posted internally first, then externally if needed. Ohio Revised Code requires that at least two candidates compete for the job through a testing process. The mayor will make the final appointment. The police chief reports to the city’s safety-service director.